Belize NMS: A tropical wave will cross the area later today and support a slight increase in shower activity. 24-hour forecast: Sunny with some cloudy spells today and cloudy at times tonight. A few showers and isolated thunderstorms will occur mostly over southern and central areas today and over the south tonight. General Outlook: For Sunday and Sunday night is for mainly fair weather with only isolated showers or thunderstorms developing. 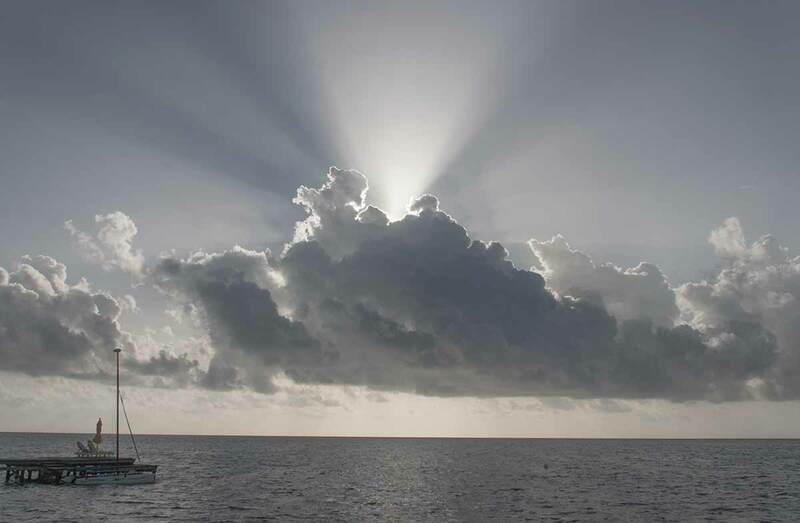 Today E-NE 5-15 kts Light Chop 2-4 ft A FEW SHOWERS AND ISOLATED THUNDERSTORMS. Tomorrow E 10-20 kts Choppy 3-5 ft ISOLATED SHOWERS OR THUNDERSTORMS. The majority of the basin is pretty quiet as very dry air prevails across the area. A tropical wave is moving across the west- central portion of the basin, however lacks convection due to the aforementioned conditions. 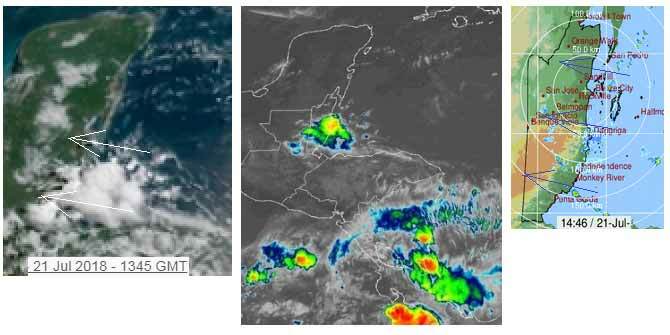 The only region of convection is within 150 nm off the coast of Costa Rica and northern Panama where the EPAC monsoon flow supports scattered showers and tstms. For more information about the wave, refer to the section above. Otherwise, the southwestern periphery of the Azores high continue to tighten the pressure gradient in the south-central basin, thus supporting fresh winds between 65W and 83W. Strong to near-gale winds are forecast at night along the Colombia coast and adjacent waters. No major changes expected through early next week. Last edited by Marty; 07/22/18 05:52 AM. On Ambergris Caye this morning the sea around our barrier reef is flat calm with a breeze from the east at 5 mph. There are a occasional short lived tropical showers. Today's expected high is 88 f.
Well it was our turn, to have a large area of ITCZ swellup over Belize last night and early this morning. Caused a fair amount of rain than thunder, cut power early this morning briefly. Still causing isolated patches of rain in any part of Belize and will continue for much of this morning. The Caribbean easterly air also has significant patches of cloud in it, that could bring continuing patches of isolated rain through the afternoon. Cloud and sunshine in the north. 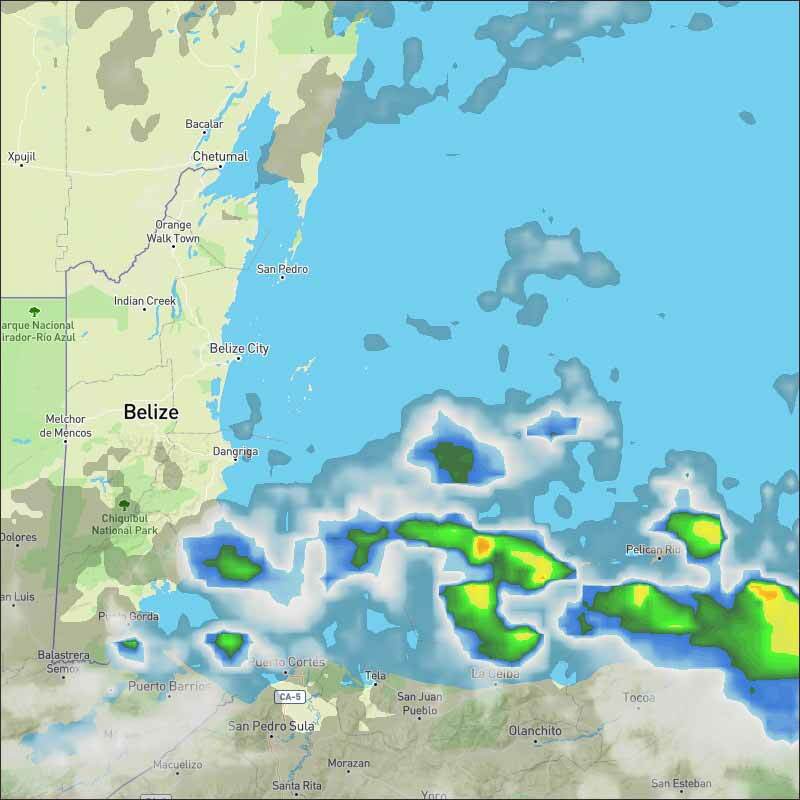 Looks as if today will be changeable, patches of cloud, rain and sun, but heavy cloud over most of central Belize for the next few hours.